Success has always been important to me. It had been easy to define—good grades in school, positive feedback in my workplace—until I became a parent. Now the idea of success is a little more ephemeral, harder to grasp. Who says whether or not I’m a successful parent? My twins are only 11 months old. Their communication isn’t yet developed enough for mommy performance reviews. My husband will have a biased view of my success; he shares in it fully after all! I surely can’t turn to the parenting books. They all have different advice, some of which is so counterintuitive as to seem downright dangerous. So, I decided to create my own definition. I will consider myself to be a successful parent when I have established and maintained a respectful, gentle, mutually joyful relationship with my children. Sounds like a lot of work, no? It will be, and I fully expect to never be done with this endeavor. But there are steps I can take along this journey, steps that will set me up for success. 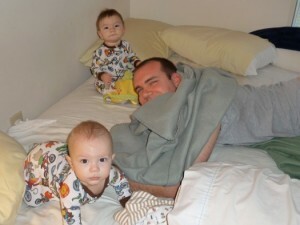 When my 34-week-old twins came home from the NICU, I was determined to keep them on the same schedule of eating every three hours, and sleeping the time in between. Unfortunately for me, no one told Jack and Gus this. They didn’t know how to tell time, and they hadn’t read the parenting books that advocate for scheduled feeds. I quickly came to realize that trying to replicate the highly structured and completely unnatural environment of the NICU was not going to work for us at home. Trying to figure out why they were hungry again so soon after being fed was an exercise in futility. The pumping/feeding/try to nurse routine became a burden to me almost immediately. I began to feel resentful and stressed on top of being insanely sleep-deprived. So I did it. We started feeding on demand, and my boys seemed happier, in their seven-week-old way. After I stopped struggling to keep my fussy, colicky twins on a crazy, adult-centric schedule, things got better. I breathed easier and felt better. This was also the time I began to cut back on pumping and I just fed them from my breast. For once the hormones were on my side! I like nursing. It makes me feel good. I was still bone-tired and prone to weeping, but I no longer found myself resenting my babies. We had become a team. My choices as a parent—to do what was best for my babies—helped set the framework for success as a parent. Now that Gus and Jack are 11 months old, I still feed on demand. When they’re hungry, they either nurse or have a snack if it’s not mealtime. There is no stress, no struggle (yet, I understand the toddler years can transform babies into picky eaters!). I don’t have to spend any energy saying “No.” I can spend all my resources on maintaining the safe, secure attachment the boys have with me. It’s excellent. We have a family bed now, but it wasn’t always this way.1 Suffice it to say, I tried organizing my babies’ sleep in much the same way I tried to organize their feeding. The early months were rough. It’s not that I had personal issues with sharing sleep. It was my normal, how my family did things when I was growing up. I just could not figure out how to make it work with tiny twins. I was, in fact, just desperate for anything to work! We tried bouncy seats, we tried swings, we did a side-car crib. I was not feeling successful as a mama, nor was I well rested. Why were these babies waking up so much? After some intense reflection and some internet research, I came to realize that they were waking often because that’s what babies do! They needed nourishment to drive their incredible growth and development. They needed comfort because they didn’t know they were safe and secure; they were operating on instinct, and that told them to seek out mama as often as necessary. It was my expectations that were limiting my success as their mother. Once I changed my expectations and taught myself to accept sleeping in smaller increments and how to nurse laying down, things clicked. We invested in a king size mattress instead of another crib, we made it into a safe sleep space for everyone, and we brought those babies into bed with us. I love sharing sleep with them. My husband loves it, too, as a way to reconnect after a day away at work. And Gus and Jack? They expected nothing less, and are happy to be where they wanted to be all along. We visited my in-laws for Christmas this year. It was a magical holiday, filled with family we never see enough, great food, and happy babies forming attachments with Grammy and Grampy. I couldn’t have been happier! 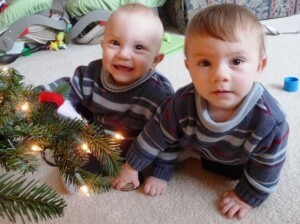 But, it was my first experience as a mama of twins in a house that wasn’t truly childproofed. I’ve come to learn there are two levels of childproofing: Level one is where you put some outlet protectors in and get locks for the doors of the cabinets that contain poisons. Very important stuff. But level two childproofing is outlet covers, cabinet locks, and putting everything out of reach. In my apartment, there is nothing within a baby’s reach that a baby can’t safely have. I can let Jack and Gus roam the place somewhat freely. I keep a close watch on them, but I don’t generally have to spend too much time removing them from somewhere it’s not safe to be. At Grammy and Grampy’s house there were tantalizing knick-knacks on the coffee table, fake holly berry and pine cone arrangements in the hallway, and plates and platters lining the buffet. We all spent a lot of time removing babies, telling them “no touching this” or redirecting them, or moving things from reach. It was exhausting. If I had to spend every day like that, my relationship with Gus and Jack would get very strained very fast. I would feel like we were adversaries. Me vs. Them, in a battle for knick-knacks. Of course, they’re only doing what babies do: exploring their endlessly fascinating environment. Instead, I can set us all up for success by arranging that environment in such as way as to make us partners in discoveries. What is this new thing in our living space? It’s green and prickly… it’s a Christmas tree! Let’s touch it and pull it and bat at it. Let’s crawl under it, and play with the ornaments. It’s ok, because the tree is nailed down, and only baby-safe ornaments are within reach. I spent less time on “No” and more time on “Yes.” And it was so fun to watch them interact with a Christmas tree for the first time! There is really no way to measure my success as a parent. The strongest indicator I have right now is the way I feel. 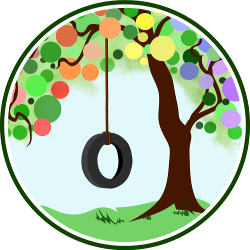 There are things I can do to facilitate a respectful, gentle, mutually joyful relationship with my children. I feed my babies on demand, share sleep with them, and create child-friendly environments. What other ways can parents promote the kind of relationship they want with their children? What are your tips? Please share your techniques and philosophies, especially any which pertain to toddlers. My babies are about to turn one! Mama Mo is a stay at home mom of twin boys, Jack and Gus. They spend their days playing, dancing to Irish music, and nursing. Mama Mo blogs at Attached at the Nip. Yes, Abbie, that really was key for me, too. It’s the single best skill I’ve acquired as a mama! First off, I love the picture of your family bed, with dad all sleepy and the twins hanging out 🙂 So precious!! Also love that you pointed out that you were trying to put your twins on an “adult-centric” schedule. It took us 30 something years to get on an adult schedule, but sometimes we just think our babies should just “go along”. Great article! Thanks, Jessica! There are a lot of things I did just because the nurses or doctors in the NICU said so. Trying to schedule the babies was one of them, and putting rice in Jack’s expressed milk to thicken it was another… and that’s the biggest regret I have. If nothing else it taught me to question authority and go with my instincts. Bringing home children from the NICU and then trying to get BF’ing up and running, wow! What a great feat, but a wonderful joy once mastered. I think the biggest difference between having my first and then my socong 18 months later was the amount of confidence I went into the second experience with. I, too, didn’t trust myself fully and relied heavily on the opinions of my son’s (childless) pediatrician. Once I became a member of a local mother’s group, however, I began to find many tried-and-true solutions to questions and very real struggles I was having. My confidence grew, and I could finally *enjoy* being a Mama. Thank you, Brynn! I know that when we have our third child, I will be much more informed and confident… with lessons well learned. Here, here! (or is it Hear, hear!) Well I hear ya! On all counts! The one I can not support enough, though, because it seems the least mentioned on Mommy sites is making our environments child friendly. My parents don’t seem to realize why I don’t like to visit their homes often or for very long. It is exhausting! Meanwhile, articles for our baby’s age range (she is 16mo) say her favorite word is likely “No!” Um… nope. Because, contrary to popular expectations, is NOT the word she hears the most! She only JUST started saying no, to the things she doesn’t want. You want a drink of water? No. Juice? No. Milk? Yes! As for feeling like a success, that is an excellent way to “grade” yourself. You felt… well, you probably felt like you were failing there in the beginning of each of those struggles, but you SUCCEEDED! Go you! Haha! Thanks 🙂 Yep, I sure did feel like a failure at first. But I’m learning and growing right along with my little guys. I love that your daughter’s bucking the cultural expectation with her favorite word.